A Day Trip to Door County! Trip to Door County, Wisconsin! 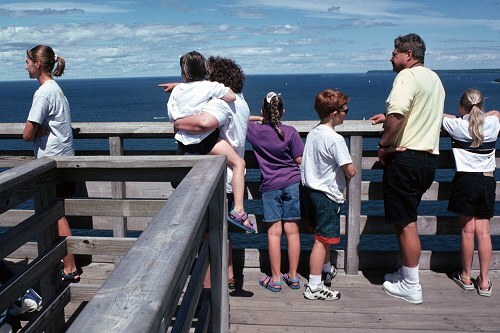 On August 8, 1999, we decided to take a trip up to Door County in Wisconsin. This is north and east a little bit of where we live! It is the part of Wisconsin that sticks out into Lake Michigan with Green Bay on one side and the lake on the other. It is a place of fish boils, cherry pie, and beautiful sunsets on the Bay side! My parents are going to build a house up there so they can retire there! I'm all excited because we will get to visit my folks in a really neat place without having to stay in a hotel. We wanted to see where they were building their house! 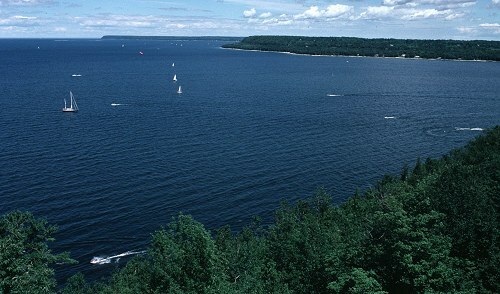 It is in northern Door County and is off the beaten track a little bit. This is a good thing since the beaten track is filled with tourists in the summer! We had a great time and a gorgeous day! The sun was shining and the temperature was comfortable. This was right after the heat broke after a horrible heat wave. Enjoy the pictures! 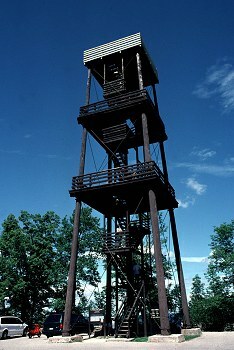 This is Eagle Tower in Peninsula State Park in Fish Creek, Wisconsin. The tower is 75 feet high and at the top you are 250 feet above Green Bay! The view from the top is magnificent, but I sure hate climbing up the stairs to get there! If you look closely, near the bottom, you can see a white shirt! That is me, starting my climb with the kids! This is how the view as you look towards the west. There are quite a few boats enjoying the day out there on the water. Gary stood away from us and shot this picture without us being aware of it! I think I'm trying to show Emily that the skinny strip of land at the far end of the bay is Michigan! Or else we are looking at the islands that are down by the water. I'm holding Emily, and Sarah is next to us in the purple shirt. 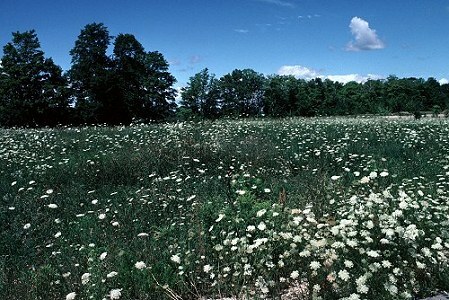 This Queen Ann's Lace-studded lot is where my parent's new house is going. They are breaking ground sometime in September! Across the street and across the lot across the street is what's left of the cherry orchard that used to be there. Even though the trees aren't being taken care of anymore, they were full of cherries! Yum! We bought some Door County cherries on the way home, and boy did they make the most delicious pie. These cherries are tart and sure taste good with just a little bit of sugar added to them! At Al Johnson's Swedish Restaurant, the roof is covered with grass. 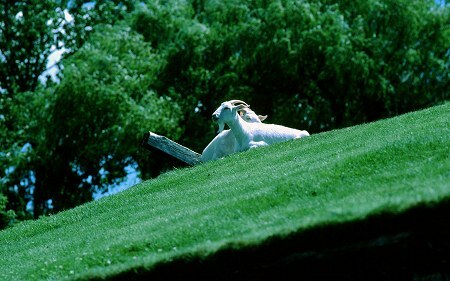 All summer long the goats have a ball up there grazing away wondering why people are staring up at them! Quite a few people were stopping to photograph and watch the goats. The goats just sit up and there and graze nonchalantly! 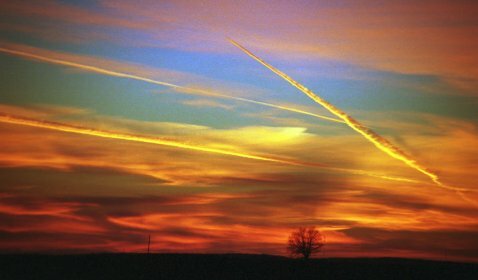 We saw this beautiful sunset while driving home from a visit to Door County back in February! It was wonderful watching the colors and effects change as we drove along. Finally, Gary could stand it no longer and we pulled over so he could take this picture. Last week, we went up again for another visit and went to watch a sunset down by the water in Ephraim, but there weren't any clouds and it was kind of boring! Oh well, not every sunset looks like this! Page updated on August 20, 2011!